← January 23- Queer Memoir debut! 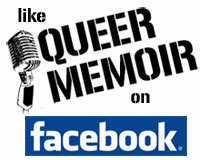 Did you miss January’s event; Queer Memoir: First Kiss? Queer Memoir is a salon for new work inspired by a monthly theme; a safe space to share memoir writing and performance; an opportunity to give voice to our collective queer experiences, and preserve and document our complex queer history; for writers, performers, and anyone with a queer story to tell. Even as LGBT characters and “out” celebrities become more common in pop culture and mainstream media, the richness and complexity of real queer lives is still undervalued and often invisible. Queer Memoir attempts to provide an avenue to share queer lives and celebrate the ritual and community-building value of storytelling. Queer Memoir’s April event will center around the theme “Scars” with readings/performances/sharing by: Kelli Dunham, Ryn Hodes, Tania Katan, Adrian Khactu, Sassafras Lowrey, Genne Murphy, and Mecca Jamilah Sullivan. One or two more performers TBA. The event is FREE, but we’ll pass the hat for cash to help support the future of QM. To learn more about Queer Memoir and how you can share your work at upcoming events, check out the rest of the site, including our submissions page. KELLI DUNHAM is a ex-nun, butch-identified stand-up comic and author of four books of humorous non-fiction, including two children’s books being used by a conservative home schooling association in their science curriculum. She has appeared on Showtime, the Discovery Channel and was once asked to emcee a livestock auction. Her website is kellidunham.com. She is the co-founder, with Genne Murphy, of Queer Memoir. RYN HODES is a fifty–something, third–generation New York native, who was recently published in “Visible: A Femmethology.” Ryn is a social worker and domestic violence advocate, a self–defense teacher, a mother, and a passionate, cranky, skeptical, hopeful, old–school femme. ADRIAN KHACTU’s work has been published or is forthcoming in the Atlantic Monthly, Carve, Heritage, and In/Vision. He has won the Richard Moyer Prize in Fiction and the Ezra Pound Prize in Literary Translation, as well as fellowships from Clarion West and Vermont Studio Center. Adrian currently lives, studies, and works in Philadelphia, and he holds shiny, though not entirely profitable, creative writing degrees from Stanford and Temple Universities (where he was a student of Samuel Delany). SASSAFRAS LOWREY is an internationally award-winning storyteller, author, artist, and educator. She believes that everyone has a story to tell and that the telling of stories is essential in the creation of social change. Sassafras is the editor of the Kicked Out anthology which brought together the voices of current and former homeless LGBT youth. Sassafras regularly teaches LGBT storytelling workshops at colleges and conferences across the country, she is a monthly columnist for Curve magazine, and her prose have been included in numerous anthologies. GENNE MURPHY is a Philadelphia native, playwright, and queer femme. She’s passionate about the intersection of the arts, social change, and community-building. Genne works for a Philadelphia-based arts education non-profit, and is involved with initiatives to expand new play development in her hometown. She is a graduate of NYU’s Tisch School of the Arts, and has had readings or productions of her plays in Philadelphia and New York. Genne likes to hang out with fellow storytellers, dreamers, and schemers. She is the co-founder, with Kelli Dunham, of Queer Memoir. MECCCA JAMILAH SULLIVAN’s fiction has appeared or is forthcoming in publications from the US, the UK, and South Africa, including Callaloo, Best New Writing, Bloom, Crab Orchard Review, Lumina, Baobab, X-24:Unclassified, Baby Remember My Name, Philadelphia Stories, and others. A graduate of the Bread Loaf Writers Conference, the Key West Literary Seminars, the Pan African Literary Forum in Ghana, and other workshops, Mecca’s awards and honors include the Charles Johnson Fiction Award from Crab Orchard Review, the James Baldwin Memorial Playwriting Award from New WORLD Theatre, Shortlist Finalist placement for the 2009 Eric Hoffer Prose award from Best New Writing, and second place for the 2010 American Short Fiction Short Story Contest, judged by Rick Moody. She has held residencies and scholarships from the New York State Summer Writers Institute, the Hedgebrook Writers Retreat, and others. Mecca holds a B.A. in Afro-American Studies from Smith College and an M.A. in English and Creative Writing from Temple University. Born and raised in Harlem, New York, she is currently a Ph.D. candidate in English Literature at the University of Pennsylvania, and is completing her first novel.